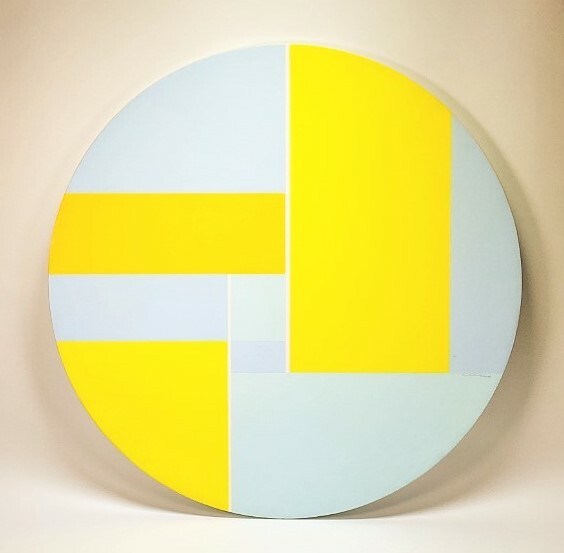 A strong candidate for top lot at Bruneau & Co. Auctioneers’ fine art auction scheduled for Saturday, February 18th, online and in Cranston, Rhode Island, is this acrylic on wood painting by the Russian-born American artist Ilya Bolotowsky (1907-1982), titled Golden Tondo B (est. $20,000-$30,000). Bolotowsky was a leading early 20th-century painter in abstract styles in New York City. His lifelong search for philosophical order through visual expression, embraced both cubism and geometric abstraction and was influenced by Dutch painter Piet Mondrian (1872-1944). Bolotowsky was mentored by Mondrian and the tenets of De Stijl, a movement that advocated ideal order in the visual arts. He adopted Mondrian's use of horizontal and vertical geometric pattern and a palette restricted to primary colors and neutrals. Post-1940, Bolotowsky hit his stride and became renowned for his work in geometric abstraction. 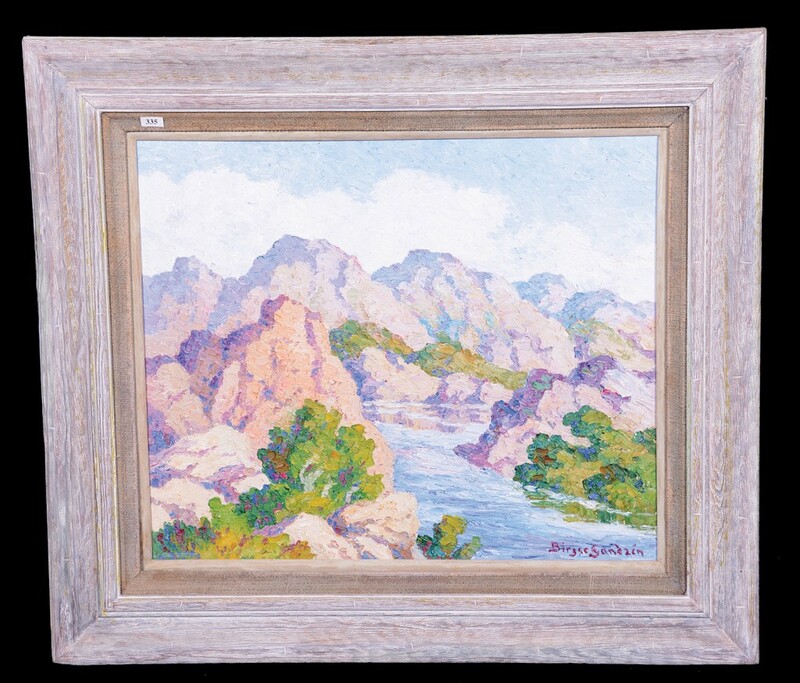 The painting in the Bruneau sale is signed and dated lower right (“74-60”). A painting by Bolotowsky purchased at a Goodwill store in North Carolina for $9.99 sold for $34,375 at Sotheby’s in 2012. Visit www.bruneauandco.com. Headlining Showtime Auction Services’ big three-day event planned for March 31-April 2 at the Washtenaw Farm Council Grounds in Ann Arbor, Michigan is the husband-and-wife team of Richard and Mary Schulte of Michigan, who will be offering their lifetime collection of gambling and coin-op items. Included in the group will be the piece pictured here, a rare “Silver Dollar” console model Jennings Chief slot machine. O.D. Jennings & Company, based in Illinois, manufactured slot machines and other coin-ops from 1906 to the 1980s. Ode D. Jennings was born in Kentucky in 1874 and worked for the Mills Novelty Company. He ran The Spectatorium, a penny arcade at the 1904 World’s Fair in St. Louis. In 1906, he left Mills to form the Industry Novelty Company, which mostly refurbished slot machines made by Mills. But in 1922, when he invented a better mouse trap by producing (and patenting) an improved mechanical coin-selecting device, one that rejected coins that were too small, Jennings suddenly became a major competitor to Mills. Visit www.showtimeauctions.com. To say that Palm Beach Modern’s Feb. 4-5 auction is packed with spectacular art pieces would be a gross understatement. The sale, online and at the firm’s gallery in West Palm Beach, Florida, will feature artworks by such luminaries as Pablo Picasso, Diego Rivera, Mario Carreno, Angel Botello, Fernand Leger, Andy Warhol and Keith Haring. All have estimates in the tens of thousands of dollars, but by far the piece expected to realize the highest amount - $100,000-$150,000 – is by an artist not everyone’s heard of: he’s Sam Gilliam, an African American. Gilliam was born in Tupelo, Mississippi in 1933 and is still producing art today, in Washington, D.C. He is a Color Field painter – a style of abstract painting that emerged in New York City during the 1940s and 1950s. It was inspired by European modernism and is related to Abstract Expressionism. Gilliam works on stretched, draped and wrapped canvas, to which he often adds his own sculptural 3D elements. The painting up for bid in the Palm Beach Modern sale is artist signed, 84 inches wide, and titled Gild and Tropic (1976). Visit www.modernauctions.com. When the impressive, single-owner collection of Emerson and Freda Moore of Wichita, Kansas is sold at auction on Saturday, February 18, online and at Woody Auction in nearby Douglass, included in the trove will be ten artworks by the Swedish-born American painter Birger Sandzen (1871-1954), as well as fine examples of French cameo, miniature lamps, Loetz, Nippon, Rookwood and more. The Sandzens include four oil paintings, three lithographs, one drypoint, one watercolor and one student oil. Sandzen lived a good portion of his life in Kansas, where he taught art. Sandzen’s mother was an accomplished watercolorist and he showed an interest in art at a very young age, attending art schools in Stockholm and later Paris. In 1890 he joined a group of artists that became known as the Artists League. He was best known for his landscapes and produced most of his work while teaching art at Bethany College in Lindsborg, Kansas, from 1894 to 1946. Upon his death, the Birger Sandzen Memorial Gallery was built in his honor in Lindsborg, a town founded by Swedish immigrants and nicknamed “little Sweden.” Visit www.woodyauction.com. Out of all the remarkable offerings in Skinner, Inc.’s two-session auction of fine prints and photographs and fine paintings and sculptures slated for Friday, January 27th in Boston, one that’s especially beautiful is the painting shown here by the French impressionist painter Henri-Jean Martin (1860-1943), titled La tour de Collioure. 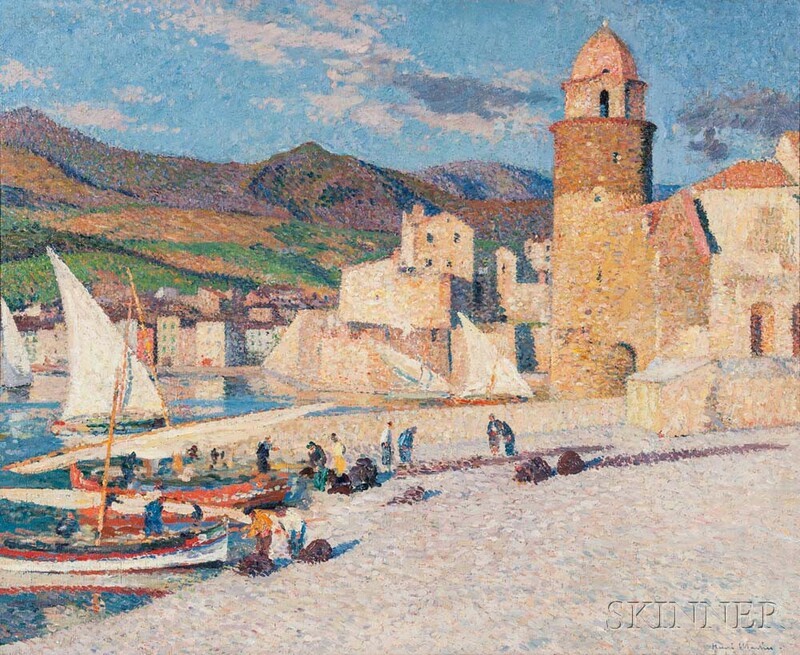 The work is an example of the artist’s experimentation with the pointillist technique most associated with Georges Seurat, used to great effect here in the misty atmosphere of a sunlit beach scene in the south of France. Henri Martin was born in Toulouse to a French cabinet maker and an Italian mother. He studied in France and Italy, earning high praise and medals along the way. His 1889 canvas submission to the Paris Salon earned him the gold medal for pointillism. Martin was an introvert and decided he had to leave Paris. After 10 years of looking for an ideal home, he bought Marquayrol, a mansion overlooking La Bastide du Vert. He did his best work in the new environment, and he died there. This work has an estimate of $250,000-$350,000. Visit www.skinnerinc.com.